This fast-paced shoo-'em-up was a huge succes on the CD32 and thankfully it's now been converted to the A1200, so those lucky enough to own one can enjoy one of the finest 3D blasters on the Amiga. Guardian is set in the future in a shrinking universe only a few light years in diameter. Different life forms are battling for the last resources and it is your job as a 'Guardian' to protect the remaining human species. In theory the objectives sound fairly simple but as always, the reality is far different. You have a nice big spacecraft, armed to the teeth with weapons and with it you must destroy the Dronoids - alien craft armed with Trilium bombs. You track them down with your scanners and choose whether to launch smart bombs or tracking missiles. As this was originally a CD32 game, control is either via a Control Pad or a combination of keyboard and mouse. This is a little strange at first but still works exceptionally well, giving you full control over your spaceship. You can perform backflips which allow you to get enemies in your sight, and with the enemies following different patterns of attack things get very challenging. The 3D polygon graphics still look good and the action is incredibly smooth. Sound-wise it isn't bad, especially with explosions, bangs and engine roars going off left, right and centre - you really do get the satisfying blast-'em-up feel of the game. The gameplay is fast and frantic and as you progress things become very chaotic - it gets the adrenaline pumping, making it an excellent example of its genre. A1200 owners should thank their lucky stars that this is now available and if pure blast-'em-ups are for you, then I'd say this is an essential buy. Steve Bradley zooms boldly through a colourful 3D landscape collecting power-ups on the way. Then he goes back for more. And more. A few months ago we got very exciting about a CD32 game, something which, admittedly, doesn't happen often, mainly because most CD games are ported from their floppy counterparts, thus ensuring we're already well versed in their gameplay. Not so Guardian. Kiwi programmers Acid Software, responsible for the quirky racing game Skidmarks, too us somewhat by surprise when this plopped on the mat. If Super Stardust is posh Asteroids then Guardian is posh Defender, only with more frills than the Queen Mother's curtains. The action is in 3D, first-person perspective and the idea is simple. You shoot things. Everything. Clear away the alien craft and move on to the next level - not quite as easy as it sounds. There are two arguments concerning Guardian. Some players think it a classic, a throwback to the days of 'real' arcade games where you plough through the levels again and again, while others reckon the structure suffers badly because Guardian contains no password facility - yes friends, when you is dead, you is DEAD. Fortunately, each game differs - you never play the same level in the same way and because there is no time limit, it's a case of destroying the enemy before they smash your installations. Although best played with a joypad, this version has an option to use the mouse in conjunction with the keyboard, which, as you can imagine, takes some getting used to. Advice desk: use a joypad. But whatever your weapon, Guardian is a thrilling game. Shooting through a 3D landscape, swerving to avoid the buildings, picking off the enemy, the scanner tells you that someone is right behind you. Palms moistening at a pace, you deftly tap the pad to flip the ship 180 degrees and suddenly you're face to face with foe. Blow him out of the skies, alien ship in smithereens and off you go. Mastering control of the ship is by no means easy, which only adds to the problems of collecting the (essential) power-ups as they appear all too briefly, before shattering on the ground. Guardian is as tough a shoot-em-up as they come - even the early levels can be soul-destroying - enemy craft appear from all directions, but then, I guess, many of you could trash us lot on the high score table. Despite the attractive graphics, objects don't slink into view as you glide along - they just appear and depart suddenly, which is disappointing. But Guardian shouts loudly on playability and the rest matters not a jot. Few shoot-em-ups will match it in '95. Smashing 3D, but could be even better. No music and great spot effects. Full on. Get this game soon. Daß Acids rasanter 3D-Knaller beim Flug vom CD-System in den A1200-Orbit Federn lassen würde, war uns klar - aber so gerupte Raumschlachten hatte das Personal im Test-Terminal dann doch nicht erwartet. Die guten Nachrichten zuerst: In einem schwerbewaffneten Schwebebegleiter über ein knappes Dutzend Planeten zu düsen, um marodierende Flug-Aliens vom Screen zu lasern, macht immer noch Spaß - schließlich stellt die zwar nicht übermäßig detaillierte, aber kunterbunte Vektoroptik nach wie vor Rekorde in Sachen Geschwindigkeit auf, und das temporeiche Baller-Gameplay steht momentan ja weitgehend konkurrenzlos da. Man trifft also weiterhin auf faire Feindformationen und ein kleines, aber feines Arsenal von Sammel-Extrawaffen, darf sich auch zu zweit (hintereinander) vergnügen und über nette Features wie ein Umgebungsradar oder die komfortable Einstellmöglichkeit der Sichtperspektiven freuen. Nur leider hat man hier nicht nur mit einem dank fehlender Levelcodes oder Continues herben Schwierigkeitsgrad zu kämpfen, sondern auch mit einer vertrackten Steuerung. So werden für rasante Kehren und den Abwurf von Smartbombs neben Stick oder Maus auch die Tasten benötigt; am Joypad war und ist man da weit besser aufgehoben. Dazu kommt eine unvollständige HD-Installation, die zwar die Startdisk, aber weder Scheibe zwo noch die erspielten Highscores auf die Festplatte nagelt. Weil zudem der bärenstarke CD-Sound für die Diskette auf eine Titelmusik und ein paar Effekte reduziert wurde, kann diese Ballerina trotz unbestreitbarer Qualitäten und mangelnder Konkurrenz auch für AGA-Amigos nur zweite Wahl sein. The Game of Champions? On an A1200? REJOICE. Then, suddenly, the A1200 conversion turned up. In a pointlessly big box with a nice picture on the front, and everything. Minutes later I was careering through the pyramid back streets of Level 3.3 with no lives and no energy, one lander to kill and a couple of tanks hurling laser bolts across my scuttering path with terrifying accuracy. I died, of course, but not before wresting a hash from the lander's claws and setting it decisively. The game of champions once more had me in its grasp. Guardian (the game of Champions) (that I'm once again the best at) is Defender in first-person 3D. And Defender being one of the most fearsome, claustrophobically exhilarating games ever in the history of all things, is no bad deal. The A1200 game's a faultless conversion from the CD32 original blessed with 90% in AP43 except with a few faults. No bombastic CD music. (The third planet's 1970's cop show track (Stock exterior shot of mismatched partners strutting down busy US street with people in background looking at the camera) is sorely missed). Slightly irritating disk access between levels. Slightly irritating non-recognition of second drive although once you've swapped from the program to the levels disk that's it. Befuddling mouse control option for non-CD32 joypad owners involving the mouse and buttons dictating your ship's direction and speed, plus the space bar for smart bomb, return for fire, tab for missiles and the left alt key for 'flip'. (While mouse control is fun for the novelty of it, and certainly helps in those swishy sharp turn manoeuvres, I find it practically impossible to use seriously. Lunging across the keyboard to 'flip' or dash off a rocket is extremely silly and even flying stably straight up in the air so I can switch the viewing angle to the superior long, high shot is agonisingly difficult). No keyboard-only option. And - hwoop - it's alarmingly unplayable. To keep up the speed of the game, every third frame (or whatever) is missed out, so objects flick from spot to spot. It's impenetrably confusing and means you're always reacting far too late to something. 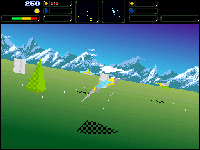 Fortunate then that Guardian defaults to a low detail view which limits the distance at which objects appear on the screen, maintains the CD32's frightening and impressive running speed and subtly improves the game as obstacles lurch violently into your path. Not, in truth, alarmingly unplayable at all then, but it's nice to have a little excitement in a review that basically says "Guardian A1200 it's just as fantastically exciting as the CD32 original." UPPERS Incredibly fast, incredibly playable, incredibly exciting, incredibly tough Defender clone. In first-person 3D. Hard drive-installable (sort of - the levels are still read from floppy). It saves your high scores on the hard drive version. No music. DOWNERS The mouse control's unpleasant, and there's no keyboard option. You really need a CD32 joypad to get the best out of the game. The high detail option's useless. It's still overly tricky to gauge the height of the floating power-ups. No music. Guardian is the Game of Champions. And now it's on the A1200. Buy it, because you know we're right. As always. Well, they said it would never appear on the A1200 so who knows, eh? No. We deceive you cruelly. It will not appear. We weep for you. One of the first CD32-only games, Guardian is billed as a no-nonsense blaster. Gareth Lofthouse leaps into the fray. The previews suggested that this was one worth waiting for. Despite being developed by one man in a single year, claims were being made that Guardian left Starwing on the Super Nintendo looking positively sluggish. Now it's here looking slick, fast and rather desirable. Still, looks aren't everything and the question remains: behind the flashy surface, does the game have a heart? Set in the far, far future (oh God, here we go), the action takes place in a rapidly shrinking universe only a couple of light years in diameter. Millions of life-forms are battling desperately for possession of the few remaining resources. You are a Guardian, one of an elite troop of pilots with the duty of saving what's let of humanity. Your task is to protect planets against attack from wave after wave of alien invaders. If you fail the human race is stuffed, but if you succeed they've probably had it anyway thanks to the universe crumpling in on itself. Now that's what I call incentive. Guardian has no pretensions as far as gaining the simulation depth of Elite and the like concerned. The object is to shaft the enemy good and proper, simple as that. Levels are cleared by destroying the droinoids dropped in waves by a huge Mothership. Though they themselves are defenseless, enemy fighters and surface craft soon materialise to give you trouble. The control system is very effective. Moving in horizontal and vertical planes means you have to hone your targeting skills to survive, but fortunately the enemy takes some time to lock on as well. The fighter slows to a halt unless you hold the thruster button on. This may sound annoying, but it's actually an asset since it allows you to slow down instinctively when you find yourself plunging full-speed into a web of cross-fire. Best of all though is the back-flip move with which you can instantly get pursuers in your sights and look pretty cool at the same time. Other special weapons include tracking missiles and smart bombs. Each enemy type of craft follows a different tactic with some, for example, fixing doggedly on to your tail while others swoop round to come guns a-blazing from an unexpected angle. As different craft appear throughout the game there's a compelling challenge in finding the best mode of engagement. Destroying droinoids can be a way of pick up power-ups such as twin laser fire and shield boosters. Other enticements include taking on the Mothership to defend the planet, a section that is actually rather disappointing. Make no mistake, the idea behind Guardian is simple, but winning through is very tough. It's a definite downer therefore that no password save is provided - going back to the start for the nth time tends to dampen the enthusiasm somewhat. Another problem with this type of action is the question of durability. The futuristic combat is exciting but some other style of challenge would have been welcome; even the ancient classic Defender had you rescuing men as a break from pure trigger pumping mayhem. An unusual feature of the game is the way you can change the viewing angle, for unlike most flight sims this is more than a flash effect. You can pull the camera up and far back and actually play effectively from an overhead view-point. Not bad for novelty value if nothing else. This is nothing short of superb. CD audio quality obviously helps, but its the mixture of the tunes and effects themselves that really enhance the atmosphere of the game. There's different pieces of music including the prepare-for-battle pomp of the title screen, and the wah-wah guitar driven dance music of level 1 - sorry about the NME spiel there, folks. Sound effects range from devastating explosions to the energising buzz noise of power-ups. It's all very convincing. Thankfully, it's a case of don't judge a book by its cover. When you take control of the fighter and start sweeping around your planet's installations, you get a radically different view of things. A 3D polygon game, Guardian immediately strikes you as very fast and smooth. This speed really enlivens the game, allowing you to battle with three, four or more enemies without any slowing of the action. The detail of the graphics improves with progression through the game. Initially the ground installations are made of simple shapes and some of the ships are run of the mill as far as looks go. On later levels, however, the landscape becomes much more interesting and the developers have obviously aimed for visual variety. Some enemy ships look great, such as the tie fighter design, and again there is a big enough range to maintain player interest. Dogfights look spectacular as you slalem through obstacles evading streams of rapid laser fire. Hit an enemy and it bursts into a cloud of fragments - satisfaction enough for eve the biggest appetites for destruction. Let's face it, as far as pure 3D action is concerned, Guardian is the dog's gonads. Frenetic, mind-numbing combat should absorb you for long enough to leave your eyes so dead your parents will be convinced you're a smack-head. This game is a rarity in that it actually looks and sounds like 32-bit technology. What's more, the attraction is more than skin deep thanks to playability that must have taken a lot of care and attention on the developer's part. In fact these combined elements could have made it a classic. I say could have, because the lack of a password save system leads to tedious restarts that dull the otherwise addictive nature of the game. That gripe aside, this title's good enough to have CD32 owners being envied for once. If you're out for plain old-fashioned action, buy Guardian and invigorate your spare time. This one shouldn't be missed. Get to grips with Acid Software's new 3D shoot-em-up. But is it the saviour of the Cd32 or just another vector graphic blaster with knobs on? There's something of a retro movement on at the moment in the games arena. Old classics are being exhumed, dusted off and flogged to a new generation of games players, unfamiliar with their ancient appeal. The likes of Space Invaders, Pac-Man, Pitfall, Galaxians, Tempest and Asteroids have all been tarted up, renamed and repackaged for the 90s. The linking theme in all these games is their simplistic playability - there are no extensive menus to negotiate, no complex missions to complete, no overblown FMV sequences to endure - just pure, balls-out playable action. And this is where Guardian scores highly. Ignoring ay plot pretensions, all you have to do is shoot things. OK, there are certain things which you must shoot, some things you shouldn't shoot, and other things that you can shoot if you want to. But, basically, there are things and you shoot them. 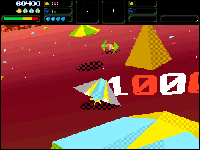 Although immediately reminiscent of Starwing on the Super Nintendo, the gameplay is actually closer to a 3D Defender, in that you simply have to destroy all the enemy bombers to complete each stage. 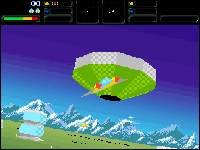 Your ship also flips direction (a bit over-dramatically it has to be said) in true Defender-style. And that's about all there is to it. Clear all the bombers, pick off the remaining stragglers and then zoom off to the next stage. Obviously things become increasingly hairy as you progress through the game new, more aggressive enemies are introduced and you're occasionally taske with entering the alien mothership for a little target practice. Once you get to grips with the controls (you have to manipulate the joypad and all six buttons simultaneously) Guardian opens up and turns into quite a pleasing little shoot-em-up. The action is unrelenting and since the confusing 3D gameworld, merciless enemies and cumbersome controls conspire to make Guardian quite tough, clearing a level of baddies is all the more satisfying. But there are quite a few things that I remain unimpressed with. For a 32-bit machine, the 3D isn't really that impressive: objects blink in and out of existence rathe than gradually increasing in size as they approach. And it's not as if any of the craft and buildings are that complex - there isn't even any texture mapping going on. When things get busy (which is pretty often) the slow-down is surprisingly bad, and as the frame rate drops so too does the craft's controllability (you're constantly under or over-steering), and your ship wasn't exactly well-behaved to begin with. Every now and then, recently demised bobers leave behind a coloured star representing a homing missile, shield refuel or laser upgrade. But steering into them in the heat of battle is a tad tricky and the little blighters conk out after a few seconds. The number of times I homed in on a star just as it disintegrated... like getting to the phone as it stops ringing. Very annoying. Having said that, Guardian still has plenty to recommend it. For starters it's one of the few CD32 dedicated games in existence, and will find favour with gamers wanting more than a straight Amiga port. The graphics are very colourful, and the CD soundtrack is good 'n' heavy. Guardian's not going to set the gaming world alight, but it'll no doubt warm your CD32 up a bit. It seems a little ironic that a game with such glorious visuals as Guardian should boast, quite possibly, the worst ever packaging in the Universe (that's the offending article on the right). The A1200 version - which is due out in December - will hopefully be snuggling in a big box bearing an image not created by Washoe the Chimpanzee. Surprisingly basic 3D - although the colours are gorgeous, and later levels do get very busy! The shiny silver platter is responsible for some very tasty soundtracks; the effects are fine. Tough to control, hard to master but all the more addictive. Passcodes would have helped. Dogfighting alien saucers while hurtling around building can be a real adrenaline surge! Nö, eher dürfte hier der Spieler atemlos dem rasanten Gameplay hinterhecheln, wenn er mit seinem Raumgleiter kreuz und quer im Tiefflug über die Oberflächen von knapp einem Dutzend Planeten düst, um marodierende Aliens vom Screen zu blastern. Vorranging handelt es sich dabei um bombenwerfende Flugrobbis, aber es schleichen sich auch mal feindliche Jäger von hinten an, Kamikazeflieger riskieren einen Frontalangriff, und flinke Minipanzer feuern wild drauf los - oder man wird gar an Bord des dicken Mutterschiffes gebeamt und sieht sich von Flakanlagen umringt. Da ist es schon hilfreich, daß der Bordlaser von der eher kräftigen Art ist, das Schutzschild einige Treffer aushält und der Gleiter trotz bombiger Beschleunigung und satter Höchstgeschwindigkeit jederzeit überraschende Kehrtwendungen erlaubt. Das Waffenarsenal kann mittels Sammel-Icons um Twinlaser, zielverfolgende Raketen oder allesvernichtende Smartbombs ergänzt werden, während Radarscanner für den Nah- und Fernbereich stets beste Übersicht garantieren. Die zunächst etwas problematische, weil sensible Steuerung leistet in der Hektik gute Dienste, doch sie erleichtert die Aufgabe nur unwesentlich - das Hochgeschwindigkeits-Spieling bringt, nicht zuletzt wegen des kompletten Fehlens von Wiedereinstiegsmöglichkeiten wie Levelcodes oder Continues, selbst Action-Profis ins Schwitzen. Frust und Lust liegen hier also eng beianander, zumal ein Modus für zwei Spieler nacheinander, die Möglichkeit zur Justierung der Sichtperspektive (über/unter/vor/hinter dem eigenen Schiff, Zoom etc.) und eine astreine Präsentation die Motivation unter Dampf halten. So suchen die bunten Polygon-Landschaften in Sachen Geschwindigkeit ihresgleichen am Amiga, und wo es an Details fehlt, springen hinreißende Animationen ein: Wenn Feinde, Bodenobjekte oder auch das eigene Schiff in tausend Trümmer fliegen, sieht das einfach toll aus. Passend dazu gibt es fetzige Heavy-Musik von CD und Sound-FX mit vernehmbarem Stereoeffekt. Only in Australia would they name the heroic saviour of humanity after a liberal newspaper. Here at AMIGA POWER, we don't tend to start off our reviews by copying out the game's plot, because a) everyone else does it, and b) game plots are an irrelevance. But Guardian's is actually quite good. So here goes. It's the future. A long, long time into the future, when the universe has reached the limit of its post Big Bang expansion and begun to contract again. In fact, it's contracted so much that it's now no more than a few light years in diameter, and its surviving inhabitants are squabbling over what's left. (The AMIGA POWER calculator reveals that, were the universe really to be "no more than a few light years in diameter", its density would be so great that it would collapse in on itself within a few picoseconds. But Guardian is a pretty fast-moving game, so that's okay). 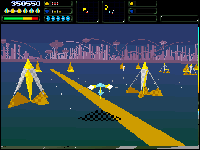 Guardian's been compared to Starwing on the SNES, a game which it superficially resembles. The ships are similar, the first level colours are identical, and you fly about in a similar manner. But apart from that, forget about Starwing. And think instead about a 3D version of Defender, which is what Guardian actually is. ('Defender', 'Guardian'. See?) Instead of trying to kidnap people, the aliens bomb buildings on the ground, and there are power-ups and things. And you can't hyperspace. But apart from that, this is a 3D version of Defender, encompassing all Defender's speed and intensity along with some terrific graphics and the overpowering sense of urgency that the plot adds. "Nya ha." 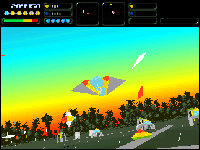 (As you cunningly position yourself opposite the alien mothership as the game begins, wait impatiently for it to release a group of Dronoids - all of which need to be killed to complete a level - and then unleash one of your limited stock of smart bombs, destroying them all in a purple flash and a shower of polygons). It really is that exciting. And all that was without even considering that 'flip' control, inherited from Defender, which is perhaps the greatest single feature of any Amiga game ever. Picture the scene. You're zooming along the ground at top speed, weaving in and out of trees and closing in on the last Dronoid on the level. Suddenly you're aware of laser bolts zipping past your ear. You bank sharply, but the bandits are hard on your tail, matching your speed pixel for pixel. Lasers are tearing into your shields, and there's a group of buildings ahead block your path. Death seems certain. But! With a swift stab at the green button, your ship performs a neat half-somersault and roll, and ends up facing in the opposite direction, still skidding backwards. You hammer the fire button and watch as one, two, three enemy ships erupt into a cloud of polygons. Twisting your lip in satisfaction you blip the accelerator to prevent your ship from sliding backwards into the buildings, and soar off in pursuit of your primary target. Even after the hundredth time, it's still great. The graphics, meanwhile, are spot-on - not as intricate as Starwing', but perhaps a little smoother-moving. They seem to make use of that special chip in the CD32, too, for the horizon and things, which presumably makes an A1200 version unlikely (although Acid claim to be looking into the possibility). The sound effects are fine, largely drowned out by the rock soundtrack (a little 1970s disco music would have made all the difference.) In fact, the only possible flaw we could find in Guardian is that the power-ups are ludicrously difficult to pick up - you've got to fly directly through the middle of them - which is a shame as it really spices things up once you've got a homing missile or dual laser. For the ultimate proof of Guardian's greatness, look to the AMIGA POWER Guardian High Score competition. We've wasted hours trying to out-do-each other and knock our most deadly foes off the bottom of the high score table, something we wouldn't normally bother with. We've even been playing in the take-it-in-turns two-player mode, for heaven's sake. It seems fairly sake to suggest that, if you've got a CD32, you buy a copy of Guardian. And if you haven't, this could be the game to push you over the precipice. No. Down the slippery slope. No. Er. The CD32's equivalent of Sonic. Or whatever. The from-a-bit-further-back view - good for spotting baddies creeping up from behind. Which they do. 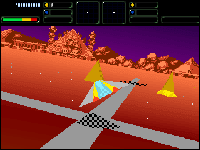 Your spaceship zooms into view, pursued by three enemies. It shoots one of them, but then runs into a huge formation of approx 3,000 baddies. It flies over the top of them all without them seeming to bat an eyelid, and then sears off into the distance. Huh? These fighters are rubbish, but their ineptitude can often be your downfall when they crash into you. Rather more worrying are these rather more skilled ones. They tend to fall for the old 'flip' trick, though. The most terrifying enemies we've so far come across are these TIE fither-style ones, which stick to you like glue. Although, having said that, these flying saucers are even worse. They run rings around you. Actually, 'Dronoid' is a bit of a crap name, so let's call them Panthers insted. You've got to destroy all these to complete a level. These tanks run up and down the roads on the first level. Tey're fairly easy to pick off. The watery levels are patrolled by these small boats who, needless to say, fire at you. And there are lots of other ones as well, obviously. UPPERS Fast. Intense. Superb graphics and sound and everything. Incredibly hard, and gets tougher the further you get. DOWNERS The power-ups are a bit too hard to pick up. A faultless evolution of Defender into three dimensions, and one of the meanest, toughest games we've played for a long time. Unlike Starwing, this has been designed as something to play, only coincidentally doubling up as a great showcase for the CD32. Acid Software have been very quiet since Skidmarks, but that doesn't mean they haven't been busy, as Tony Dillon discovers. Mark Sibly is the man who is responsible for Blitz Basic and one of the most perfect Amiga conversions of Defender ever (well, several of them anyway). Almost a year ago Mark Sibly came to London on a flying visit, and brought us a playable demo of his latest 3D shoot 'em up engine. Essentially he had taken a look at Starwing on the Super Nintendo, a game that many magazines were raving about at the time, and realised that it wasn't doing anything that the Amiga wasn't capable of equalling, if not actually bettering hands down. The end result was a single level shoot em-up called Sibwing. Then it all went quiet. Suddenly, one day, completely out of the blue, a silver disk appeared on my desk with a single word on it - Guardian. Loading it up, I found it to be the completed Sibwing, gone through a few changes, sure, but even more playable and exciting than it ever promised to be. Acid Software are back, bigger and better than ever. In a nutshell, Guardian is Defender. Mark has written over a hundred different versions of Defender in his time, so that's no surprise. What is nice is the ease in which he has taken such a simple game concept and translated it into a 3D extravaganza. You are a lone pilot, patrolling a group of unnamed planets somewhere out in space. One day on a routine run the planet is invaded by alien craft, hell bent on destroying all the buildings and vegetation on the surface. What more is a lone pilot to do except get out there and take them out! There are basically two different types of enemy craft attacking your planets. The first, and most deadly to you are all the fighter ships that materialise in random positions on the planet after being beamed down from the mothership which is loitering above the globe. These are only interested in taking you out, and will home in on your ship the moment they appear, with all guns blazing. There are dozens of different types that will appear, but all follow more or less the same pattern to begin with. Appear, fly around at high speed and then home in. The nice thing is that none of them are particularly intelligent, and they will fly into buildings and other obstacles while making a bee line for you. The second type of craft is almost completely harmless, but are the most important to destroy. The bombers, as they are called, are there to destroy all the buildings and installations on the planet, and systematically travel across the landscape raining destruction upon everything in sight. Your mission objective is clear. Stay alive long enough to take out the waves of bombers that appear, and then clean up al the fighters still alive. Once a certain number has been destroyed, it's off to a different part of the globe to save yet another civilisation. After you've done this part a couple of times, you'll be told that a tractor beam is now operating. This is coming form the mothership. This scenario takes the place of the end of level guardian, pitting you against a whole host of smaller enemies instead of a large one. You are pulled form the planet surface inside the mothership, from which vantage point you can see all the exit ports where the fighters are coming from. Your job here is to take out every single port before the aliens tart emerging, because once they do, you're in serious trouble. Some aliens drop special bonuses when shot, which look like enormous bouncing jacks. A bit of skillful flying is all it takes to scoop these things up, and they can b anything from a laser boost to a shield boost to even a tracking missile, which will lock on to the nearest bomber and blow it out of sky. The only other weapons in your armoury are a double laser, which can fire two shots forward instead of one, and a limited supply of smart bombs. There isn't really a lot to choose from, sure, but then there wasn't much to choose from in Defender. You can probably tell from the various screenshots dotted around this page that the game is based upon Starwing. The bright colours used on all the objects, plus the style of the other craft show pretty much where the game is coming from. What this leads into, though, is a very strange viewing perspective. The game is viewed in the third person, i.e. behind your own ship, but you don't actually look directly along the craft. 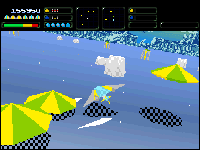 The height of your ship is variable, but the height of the camera isn't, so if you are skimming along the ground or flying as high as the game will allow, you are left looking down or up at yourself rather than forward, which limits your view somewhat. Oddly enough, this doesn't actually detract from the playability of the game once you get used to I. If you don't like the angle you are being viewed form, you can always move the camera position to suit you. One gripe with this system that some people had initially was that you had no real way of targeting your shots. Although you always fire forward, the height of your craft coupled with the yaw means that you can fire in all directions along the y axis and judging where your bullets are going to go is an acquired skill rather than an intuitive one. The controls are worked out extremely well, with the top two buttons on the controller moving your craft forward or back, the large red button is your cannon, the blue and yellow buttons handling missiles and smart bombs respectively while the green button lets you pull off quite a nifty 180 degree flip, enabling you to turn and fire at whatever happens to be chasing you. Guardian is an unusual game, but wildly addictive and great fun to play. Extremely challenging, both mentally and physically, this is a game where you'll really work up a sweat. It might not be the smoothest or most original game in the world, but it's well worth having nonetheless. Is Guardian a fitting follow up to the great ? Yes I definitely think so. Not very original and difficult to master, but it's still great!